« The second anniversary of Operation Cast Lead: Lift the Blockade! My friend and fellow blogger, Richard Silverstein, just shared this poster created by Michael Levin. The singular focus in Israel and the American Jewish community on the release of Gilad Shalit is profoundly problematic. Why is this one person’s imprisonment more important than the thousands of Palestinian prisoners from the West Bank, including over 300 children minors held in Israeli prisons? Gilad Shalit should be freed just as the Palestinian prisoners should be freed. The families of the Palestinian prisoners face enormous obstacles visiting their loved ones held behind bars. I encourage you to share the poster with others. Abdullah Abu Rahmeh is a leader of Palestinian non-violent resistance on the West Bank; Ameer Makhoul is an Israeli Palestinian citizen, an advocate for the rights of Palestinian citizens of Israel. You can find statistics on Palestinian prisoners in Israeli jails here. This entry was posted on January 3, 2011 at 11:03 pm	and is filed under Israel, Palestinians. You can follow any responses to this entry through the RSS 2.0 feed. You can leave a response, or trackback from your own site. This poster is fantastic and conveys as you noted so “profoundly” the one-sided focus of Israel and the West, particularly in the Jewish community, on Gilad Shalit. Your commitment to justice for all is so inspiring. I’ve posted the poster on my FaceBook page and will forward it on to others. Thank you for sharing this with all of us and thank you especially for living the prophetic tenets of Judaism! Sorry. I do not entirely agree. In a civil society there is always some number of individuals who cannot restrain themselves. A responsible society must restrain them. Which should not be misunderstood to mean that I am somehow comfortable with imprisonment without trial, or detainees, who must be given fair trials with competent legal counsel. All prisoners, even those guilty of the most reprehensible crimes, should be able to have visitors, if only under very controlled circumstances. There is misuse of authority in Israel as well as the US and countless other countries. That should not be tolerated. But there can also be appropriate use of authority, which is a duty of a responsible society. I think it is always dangerous (except in this sentence) to make, or appear to make, sweeping generalizations. It makes us sound irresponsible and may actually make the real message harder to hear, namely, that the human rights of all should be honored and defended without compromise, and that wherever possible a measure of tenderness should also be exercised. Thanks for your comment. The poster conveys the double standard regarding the treatment of Palestinian prisoners and Gilad Shalit, the one Israeli prisoner. Some of the Palestinian prisoners have been tried in a military court on the West Bank, hardly a fair procedure in terms of justice. Many of them have not been tried, some are held under Administrative detention, held for extended periods of imprisonment without any trial and some are prisoners who are held without anyone knowing that they are imprisoned. Over 300 are children. In this context, focusing only on Gilad Shalit seems totally unfair privileging him (because he is an Israeli Jew) over many individuals (because they are Palestinians) who suffer a similar and in many cases, worse injustice that he. I think the main point is that when we talk about Gilad Shalit, we must also talk about Palestinian prisoners. I agree. I took a long time to post my original comment because I couldn’t find the sweeping generalization in your post nor could I find it in the poster. And yet there was something troubling me. Long before anyone can read the nuance in your post or in the poster, that thread, like a screaming headline, has the first word, and, as with many screaming headlines, it misrepresents. If people don’t like “Free all the prisoners” then “Free all the hostages”. I imagine the numbers will be very similar. The Israeli government should not be detaining Palestinians from the West Bank and Gaza at all, as it is an occupying power and it has no legal jurisdiction over the Palestinian population. Particularly problematic in legal terms is the transfer of Palestinian prisoners to jails within Israel (usually Ketziot and Megiddo). The Israeli authorities have no right to do this, even in the case of genuine criminals. It should be the responsibility of the PA to ensure that justice is carried out, so the call to free all the prisoners is apt – they should not be in Israeli prisons in the first place, irrespective of whether they have committed a crime or whether they are being held without charge. But can you state with certainty that all Palestinians in Israeli prisons were arrested on Palestinian land? Can you state with certainty that they were all arrested for political reasons? Beyond that, though, we are being diverted. I am not disagreeing with the intent of these posts. I am only asking that we are careful in what we say, especially in a public forum. This blog offers an opportunity for considered reflection by well-intentioned people. Why not avail ourselves of that? Obviously, not all Palestinian prisoners have been arrested for political reasons. Some are simply criminals and, hopefully, received prison sentence commensurate with their crimes. What we can say is that all the Palestinian prisoners in Israel or in the P.O.T were arrested in the historic land of Palestine. Thank you for the civility in expressing your point of view. Your claim that Israel has no jurisdiction in the West Bank is ridiculous. UN Security Council Resolution 242 gives Israel authority as a military occupying power there pending the conclusion of a peace agreement, which includes law enforcement. The Oslo Agreements were drawn up on the basis this agreement. Thus, although the Palestinian Authority has the power to arrest and convict criminals, if they abidate this responsibility, it then falls on the Israeli authroties. A recent example of this were the six Palestinian convicted of first-degree murder of 4 Israelis a few months ago. The Palestinain arrested them and sentenced them to prison. A “benevolent, merciful” Abbas then pardoned them after a few months incarceration, so Israel then moved in and arrested them a few days ago, all of this in accord with 242 and the Oslo Agreements. This post is in response to Y Ben-David and ElaineM. If we wish to claim legitimacy for any position, history is ambivalent. You are required to say history began on a certain date. By one standard you can call it the historic land of Palestine. By another, Israel. Both standards are flawed unless you believe no human beings occupied the area before there were written records. Even archaeology relies on assumptions. To claim that the final word comes from the UN Security Council is just as flawed. Many people posting to this and other blogs have profound arguments with decisions and even the constituent memberships of the security council, though we may differ about what we don’t agree with the UN on. And both arguments prove nothing. Many of us are posting to this blog from lands which were occupied by Native Americans. Don’t ask me which ones, that again would depend on how far back you want to read history, and on who is writing that history (hint: the victors). And, by the way, why can I not reclaim the farm in northern Germany that was confiscated from my Jewish grandparents? And by what right was that land ever sold to them? By whom? I think we can agree that many people on every side have suffered too much during every war or hostile situation which is not called a war, such as occupation. I think we can agree that national leaders often behave like enemies of peace. I think we must agree to set aside any notions of exceptionalism. We are all human, all flawed, we have all accepted certain claims without skepticism. I hope we can agree that however this ongoing crisis in Israel-Palestine and the region is resolved, nobody will ever be restored to what existed before. Losses will not be recovered. Grieving will not end. And yet it is possible in the face of all of that to proceed with an intention to do no more harm. Consider for a moment the spirit in which the Amish parents of those schoolgirls reached out to the parents of the man who murdered their children. Consider the spirit in which the parents of a Palestinian boy killed by the IDF, and the parents of a Jewish teenager killed by a suicide bomber in moments of shock and grief allowed organs of their dead children to be donated to members of the ‘other side.’ Those parents knew right then and there that there is no other side, and that there is only one way forward and that is to avoid hurting more people and to help those we can help. The first requirement of such a future is a refusal by each of to continue to nurture grudges. However legitimate we may feel those grudges to be, we are selective in what we choose to remember as intolerable and what we choose to tolerate. The alternative is that our great-grandchildren will slaughter one another because of our legacy of grudges. Is that really what we want them to inherit? When you say you all advocate freeing all the prisoners, does this include those like Marwan Barghouti who was convicted of five counts of first-degree murder (one of his victims was a girl who had attended my synagogue) and those of HAMAS and the Al-Aqsa Martyrs Brigades that planned and/or helped carry out the series of suicide bombings that killed or wounded thousands of Israelis? 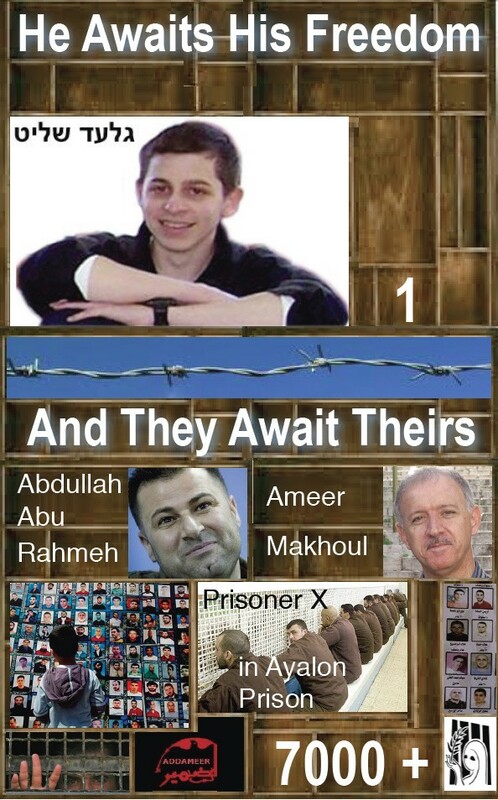 These are on the list of prisoners that HAMAS is demanding be freed in return for Gilad Shalit. The disproportion you mention is strikingly illustrated on Alison Weir’s excellent site If Americans Knew. She shows graphically how Palestinian deaths are vastly under-reported if even reported at all. Placed side by side with reporting on Israeli deaths, the contrast is stark and telling. The prisoner issue is only more of the same. All those arab prisoners. Its so sad. I guess they should not have participated in activities that specifically targeted Jewish children. I guess those arab prisoners should have stopped committing actions with the intent to eradicate an entire nation. Are you referring to the hundreds of Palestinian minors in Israeli jails? Those who have been arrested without trial? Those who are in jail because they are leaders of non violent resistance? Are you concerned only about acts that target Jewish children? Why not acts that target any child or any human being, regardless of ethnicity or religion?